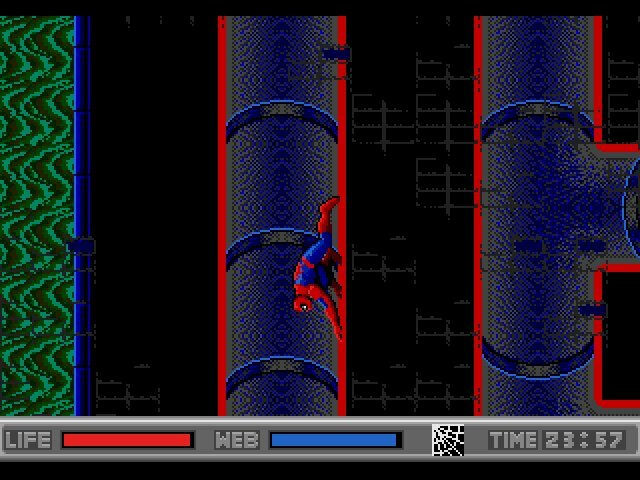 The Amazing Spider-Man was one of the Genesis’ early games, and a pretty enjoyable run at playing as the web head. However, it looked pretty rough, and didn’t sound all that great either. 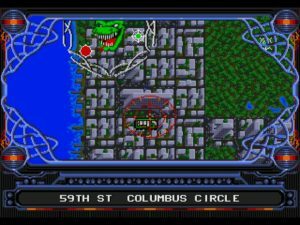 Enter the Sega CD “remake.” Unlike other ports, this isn’t tacking on some new arcade sequences or CD tracks to the original game. Instead, this is a top-to-bottom reworking of the original game, with new art, new animated cutscenes, and a few gameplay tweaks to go with. Shooting webbing at the police probably doesn’t help prove your innocence. The plot hasn’t changed, but it’s still a decent one. The nefarious Kingpin has planted a bomb somewhere in New York City, set to detonate in 24 hours. Using his power over the media (and a liberal amount of suspension of disbelief from the player), he has convinced the people and authorities of NYC that Spider-Man has planted said bomb. 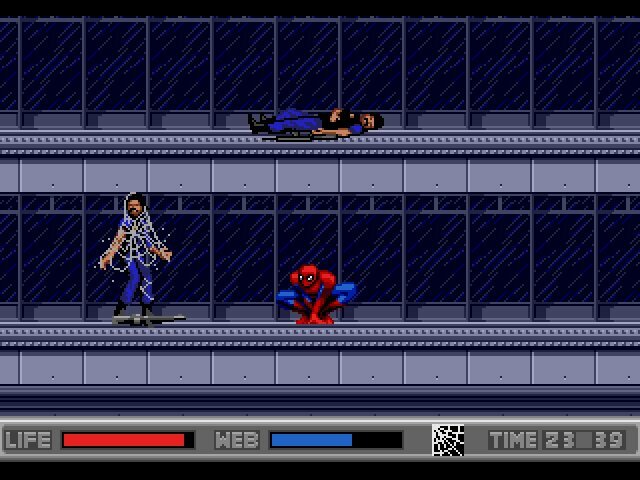 Spidey has to run from angry citizens and the law, while trying to find five keys needed to defuse the bomb. These keys are held by – you guessed it! – a rogue’s gallery of Spidey’s classic foes (most of the Sinister Six). Those 24 hours are actually counted (albeit accelerated), so you’ll be doing your best Jack Bauer impersonation as you rush through the city. New to the CD release is the ability to pick your next destination. You scroll through a giant map of Manhattan, with levels marked as landmarks. Boss characters (which advance the plot) show up as giant faces marking their location. The rest of the levels are either empty, or filled with generic thugs. Your major reason for wanting to visit the extra locations is to search for health and web powerups to top off your meters before hitting the next boss. Controlling the web crawler is simple and satisfying. 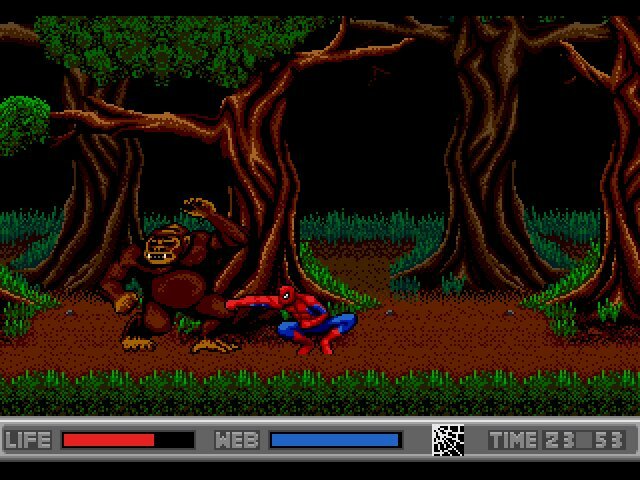 A attacks, B shoots web, C jumps. You can tap B for a quick shot that will tie enemies up, or hold it longer to spray them into incapacitation. Hitting B while jumping will deploy a web swing diagonally. In most locations, you can hold C to stick to background buildings or crawl along ledges (especially helpful in the sewer). Crawling along the ceiling to avoid foes is very neat, unique, and a good nod to the character’s abilities. The only real misstep is the combat. There is absolutely nothing to it – it’s the bare platforming basics of moving toward an enemy while avoiding their high or low attacks, then punching them in the crotch until they fall. Fighting is not exactly a marquee feature though, so the game doesn’t really falter. 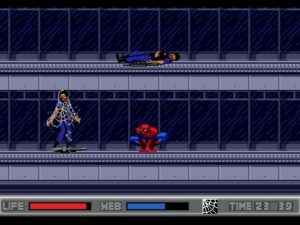 Except for adding to an arbitrary score, there is absolutely no reason or benefit to fighting any thugs whatsoever – and Spidey’s evasive abilities are certainly up to keeping you out of harm’s way. A giant version of The Lizard appears to be consuming the Upper West Side. Your web attacks are limited by a blue fluid bar, and refilled by finding icons within the world. You do not have to purchase web fluid, which is one major change from the Genesis original. With nothing to buy, the cash system has also been stripped – and with it, the ability to take photos of enemies for cash bonuses. It was a neat feature in the original that gave you something different to do, but really, it’s not missed here. 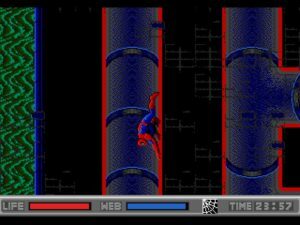 You also can no longer return to Peter’s apartment to regenerate health and webbing at the cost of time, which is a bit of a disappointment, but all levels are generally well-stocked with extra powerups. The nicest feature is the password system. After you defeat each boss, you’re granted a password tracking all the bosses you’ve defeated previously and their keys. This allows you to pick back up at any time. It can be a bit too generous though – every time you use a password, the clock is reset to the full 24 hours, somewhat negating the point. And as much as I hate to admit it, not having to beat the game in one sitting does limit your reasons for replaying. 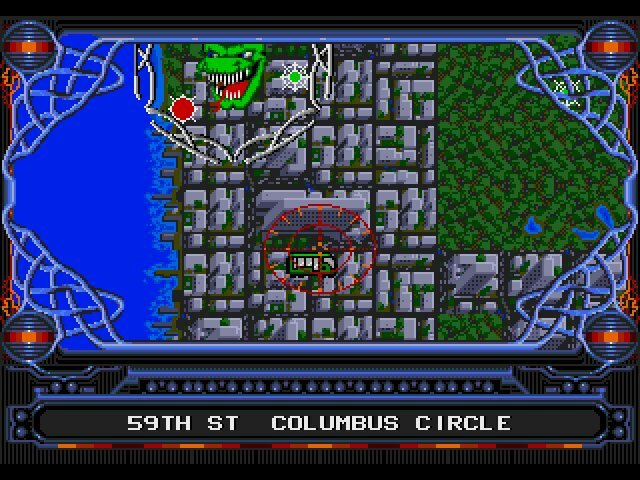 The map screen gives you the freedom to pick your next boss battle, but that’s about it. Other than potentially shaking up the order in which you tackle the bosses, nothing else in a future playthrough will change. Since the game is essentially all about fighting the bosses, it’s interesting that most are unbelievably easy. Kingpin and Doc Ock have simple patterns that are easily avoided. Vulture is all about timing your jump kicks for when he telegraphs his swoop attack (which is also his only attack). Electro gets stuck on platforms above or below you, making him a cinch to hit. Only the Sandman puts up a real challenge – and only if you didn’t first take care of the gorilla sharing his level. The game’s a fun challenge, but not a serious one, making me wonder if the intended audience is young kids. Spidey can stick to, and crawl along, walls and ceilings. The new animation sequences add further suspicion that the game is meant for the ten-and-under crowd. Animation is drawn like a low budget Saturday morning cartoon, and voiced even worse. Spidey sounds like The Tick, and delivers every line with overemphasized bravado. Half the villain roster is voiced by America’s sweetheart – the irrepressible Mr. Cam Clarke – and he runs through every “crazy” or “insane” version of his limited vocal range. Acting is at a radio theatre level, but I have to say this seems as much intentional as quick and low budget. They seem to be trying to emulate the style of Spider-Man and His Amazing Friends, and probably thought kids would find the exaggerated characters funny. Also remember that this predates the excellent mid-90s animated series, so they didn’t have that as a reference. I feel like this one got overlooked as another cash-in CD “remake” of an existing Genesis game, but that’s not the case. They actually took some time with this one, and made a version significantly improved over the original. The missing features aren’t critical to gameplay, and the added ones – new levels, faster movement, the overworld map – are definitely worth the trade. The animated cutscenes are a cheese factory, but at least they made the effort, and most of the CD tracks make for excellent wall-crawling background themes. In all, a pretty great Spider-Man game worth checking out for web-head fans. Sharper, cleaner graphics over the original. Good CD background music. Animated cutscenes won’t win awards, but are an improvement. New levels and bosses (Mysterio). Password system. Open overworld lets you pick your next level. Missing the ability to take photos of crooks for cash, and the ability to regenerate in Parker’s apartment. Password system resets time, cutting out much of the difficulty. Bosses practically trip over themselves. Cause it’s Swing Time! Flying for justice! Swing Time! Take no prisoners! Swing Time! Bring out the big guns! Swing Time! Knock that trouble ooooooout!